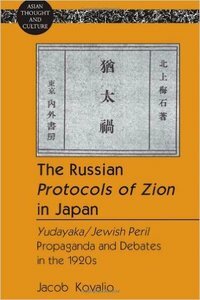 Jacob Kovalio, " TheRussian Protocols of Zion in Japan: Yudayaka/Jewish Peril Propaganda and Debates in the 1920s "
This work is about the swift process of acculturation of antisemitism in Japan - a Shintoist/Buddhist society with no Jews - in the decade following the First World War due to the impact of The Protocols of the Elders of Zion. Major Japanese primary sources related to the subject are introduced in detail and analyzed in the book for the first time in any language: the 1921 Imai Tokio-Yoshino Sakuzo impromptu debate, Higuchi Tsuyanoske's best-seller Yudayaka [The Jewish Peril], the March 1929 roundtable on the Jewish Problem organized by the Heibon publishing house, and writings by Ariga Seika, Soebe Inchinoske, Yamanaka Minetaro, Kinoshta Masao, and others. This is also the case with most materials mentioned in the section on Japanese awareness of antisemitism before and during the First World War. In addition, the author proposes, defines, and demonstrates the applicability of the term Conspiracy and Scapegoating Antisemitism to both non-Japanese and Japanese milieux.